Ski in / ski out emplacement n'a pas obtenir beaucoup mieux que dans ce charmant 3 chambres Saddlewood maison à Breckenridge. Tout ce que vous devez faire est de cliquer sur vos skis ou snowboard et glisser vers le bas de l'ascenseur flocon de neige qui est jamais bondée. Seuls quelques-uns des maisons dans le quartier Saddlewood sont situés à droite sur le bord de la piste de ski. Il est à noter que ceci est la plus grande des plans d'étage 3 chambres dans les maisons de ville Saddlewood. Situé sur trois niveaux, il ya beaucoup de pièces pour les groupes pour trouver l'espace ou se rassemblent dans la salle à manger voûtée. Le plan ouvert salon voûté, salle à manger et la cuisine est idéal pour se divertir. Profitez de la vue spectaculaire sur la chaîne Ten Mile et la vallée du comté de Summit Blue River. Chambre à cet étage a un lit queen. Salle de bain complète. Au large de la salle à manger est un balcon pour profiter pleinement des vues dégagées. (Toutes les unités Saddlewood ne sont pas assez chanceux pour avoir ces points de vue!). La cuisine est bien équipée avec les ustensiles de cuisine car nous proposons souvent cette propriété entièrement approvisionnée - demandez les tarifs et les options. Salle de télévision avec accès au bain à remous privé, chambre avec lits superposés pouvant accueillir 4 personnes dans deux couchettes. Salle de bain complète. placard blanchisserie. Chaque niveau est desservi par sa propre salle de bain pour plus de commodité. The unit is great. Plenty of room. The kitchen was well stocked with cooking supplies. It is ski in / ski out with some polling. Very close to the Snowflake lift. Great space for family trip. Great ski in ski out property. Very well furnished and an excellent family experience. Thank you so much for staying with us. Come back soon please! Comfortable home with pros and cons. Oven was dirty and smoked with first use, setting off the smoke alarms for an irritating long time. We set it on self clean and had no further problems. Check out instructions of taking out trash and all dishes washed. We leave at 6:00 am to drive home and this was almost impossible. We rent a condo every year and this was the first time we have encountered this step in check out. Memory foam type mattresses were not the most welcoming and would wake us up when changing sleep positions. Thanks Scot for staying and taking the time to write the review. Come back soon. Great location but place needs to be cleaned out! We had a really nice stay & loved the location to the mountain & to town. The condo is spacious, has nice bathrooms, and comfy beds. The hot tub worked great, although the stand on the cover was broken. It is a true ski in/ski out, the ski in is a long catwalk with lots of skating and slow spots. It just makes you earn your lunch break 😆�. My only complaint with the condo is that the place needs to be cleaned out! The pantry was FULL of old food & not just spices, which I can appreciate, but open cereal, chips, tons of canned food etc. Also, every closet was full of crap, old clothes, left items, blankets and pillows everywhere. There was no space to put our things in the closets. Every drawer had stuff in it. We also felt that there was too much furniture & big bulky furniture in every room to move around comfortably. None of these things are deal breakers, and we would consider staying here again, but management should take care of the clutter. It also took us several months & several follow up emails to get our security deposit back. We stayed here for 4 nights this winter in this wonderful home. It's in a great location with the snowflake lift located literally behind the house so it made getting to the slopes a breeze. The home was cozy with plenty of space available. The living room had a large couch which was great for or group to hangout in the evenings. Getting into town is easy, while Uber is pricey in Breck, the free bus is a 3 minute walk from the home. Both peak 8 and 9 are easily accesible from this home. 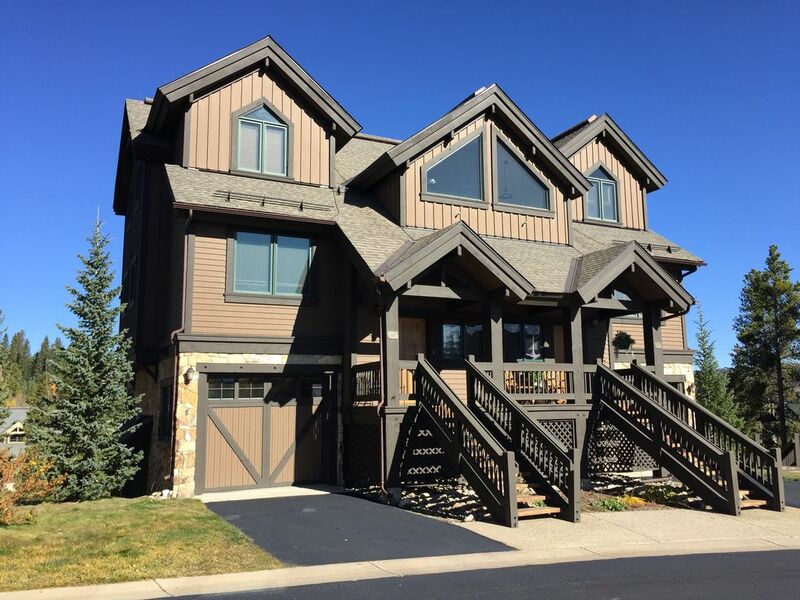 If/when we return to Breck, we would want to stay here again! I would only recommend a larger TV in the living room. I know not much time is spent watching TV, but it sure would be nice for Sunday night football! Thank you so much for staying at the Saddlewood Townhouse. We really appreciate all your comments and hope you come back to visit us again soon.